With just a few weeks to go before our work was to begin, I took my wife Denise to visit the historic pool at the Biltmore Hotel in Coral Gables. I wanted to take a long look at what was (and may always be) the largest re-plastering job I’d ever landed. As I stood at the edge of what can truly be described as a huge pool, I actually thought for the first time in my career that I’d bitten off more than I could chew: The surface of the massive U-shaped pool was in terrible shape and dragged down the hotel’s otherwise beautiful decor and landscaping. But there was no turning back, so from that point until the job was complete, I thought about nothing other than the project, planning for every conceivable detail, looking at the operation in all its facets and considering all it would take to get the results the customer was demanding. I even started a notebook and kept it with me constantly, writing down questions as they came to mind. And I didn’t let anything go until I was sure I knew the answer. It was quite an adventure, and the best thing is that we all lived to tell the tale. I first heard about the project from my friend, John Centera, owner of Starlite Pools in Sunrise, Fla. He had been asked to bid on the pool’s restoration, which included some tile work and minor repairs, but the bulk of the work would be preparing for and installing a new surface. He wanted a local plasterer with the ability to handle large projects. That’s our specialty, so we got the call. Centera cautioned us that the project timeline was set in stone and that we had only the few weeks between Thanksgiving and Christmas to get the whole job done – and that once we committed ourselves, there could be no turning back. We knew it would take a company like ours, with the staff, the equipment and, most important, the project management needed to get the job done in an orderly way, but I told Centera I needed to think it over. I visited the site, did a careful inspection and, before submitting a bid, mentally walked through as much of the project as I could, trying to visualize how each phase would come together. Ultimately, I sent Centera a bid he incorporated into his master bid. 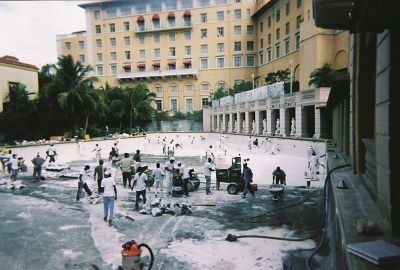 According to the plan, Starlite was to do all the prep work and the tile repair; we would tackle the installation of the Hydrazzo, a type of polished exposed-aggregate finish supplied by Aquavations, which happens to be based in Coral Gables and would play an active role in the project. From the outset, it was clear we’d all have to work hand in glove to make it all work – but there was so much more to the job than setting up divisions of labor. In fact, the project was so huge that I needed to double the size of my own crew to about 65 finishers and laborers, which meant coordinating with competing plastering companies in the immediate area. Before I finished, I’d enlisted top people from six other firms; they saw cooperation as a good opportunity to make a nice dollar for a day’s work and become involved with the most prestigious job any of us had run into in a long time. Denise worked closely with these contractors to make sure that everyone had cleared their calendar for the big day – December 7. We organized the workforce into two groups – finishers and laborers – and established a chain of command for each. We also developed a tight schedule for the placement of equipment and supplies as well as for the arrival and dispersal of labor over the various portions of the pool. In the weeks leading up to December 7, Starlite surveyed the pool, sending in a diver to determine the nature and extent of the damage to the plaster. Starlite’s inspection and subsequent analysis of some plaster samples collected by the diver revealed that the pool had been resurfaced at least six times through the years, leaving behind what looked like sedimentary layers of material that were up to three inches thick in some spots. Our initial plan was to take the plaster down by two or three layers to reach a solid, uniform substrate and then install the new finish at a uniform depth of about half an inch. The work began in earnest November 26, just after Thanksgiving, when Starlite’s crew set in pumps to drain the pool. Hotel staff had estimated this process would take only half a day, but in actuality it took more than a day and a half. At this point, we discovered that nobody knew how much water the pool held; suffice it to say we were dealing with more than any of us had ever dreamed of. Once the pool had emptied, Starlite’s crew began chipping out the surface – and we immediately ran into trouble. Centera informed me that the existing material was inconsistent and that some areas were easily removable and others so hard that even jackhammers proved ineffective and no more than a half-inch or so could be removed. There would be no problem building up from this remarkably hard material, but the variable thicknesses of the substrate meant that we would be forced to increase the depth of the new surface in the areas where it was necessary to take out more old plaster, forcing us to lay new material more than two inches thick in some spots. Getting a huge job done on a short timeline required mobilization of more than 65 laborers and finishers drawn from a half-dozen plastering firms. The logistics involved in keeping so large a group working as a team was indeed a tremendous challenge. At first, this depth differential looked like a show-stopper. For one thing, it meant we would be using far more material than initially anticipated. Of even greater worry, however, was the concern that, when applied so thickly, the Hydrazzo finish would develop shrinkage cracks or cure unevenly. (Typically, these finishes run no more than an inch deep.) Fortunately, the staff at Aquavations was able to make some key adjustments in the product’s formulation that enabled us to apply it in greater depth and still achieve the smooth, uniform finish required. This crisis averted, we ordered up 120,000 pounds of the pre-mix material in a standard Scandinavian Rose color chosen to match the terra cotta plaster on the hotel – and then we waited for Starlite to hand the job over to us. As that day approached, Starlite’s prep crew worked seven days a week in a fevered attempt to lower the high spots and decrease the depth differentials. Amazingly, they were able to remove material that was as hard as any old plaster any of us had ever seen. By the time they finished, the differential in material depth was less than two inches – not ideal, but workable. As a final preparatory step, Starlite’s crew applied an elastomeric bond coat to give us a uniform adhering surface. This was intended to eliminate any absorption problems we’d be likely to encounter over the vast surface area of the pool and provided us with an effective mechanical “key” for adhesion of the new surface. We spent a good bit of time simply reviewing and working through our game plan – dividing the pool into five zones defined by tile breaks that run through the pool’s interior and thinking through the process from the point furthest from our access area through to the final spots in one of the pool’s two shallow ends. Once on site, we started in one shallow end, moved through the deep end and then up into the pool’s other shallow end. Although it’s unusual in a renovation to end up in the shallow end, it made the most sense given the layout of this particular pool. Fortunately, we were able to make relatively short work of finishing the floors through use of a (successful) prototype floor polisher offered to the project by Aquavations. We planned to do the largest of the sections toward the middle of the day, at a time when we knew we’d have the most people on hand to help. As our time on center stage approached, we had everything in place and had left nothing to chance – except, unfortunately, the weather. On December 7, I left for the site at about 2:30 am so that I could take my time, ease into the work and prepare myself mentally for the day ahead. When I arrived at about 3 am, it was pouring rain, and the forecast called for showers during the early part of the day. This caused some serious concern, because nothing in the plan accommodated weather delays. Working with so many different companies meant we had no choice but to make things happen on time. As I watched all that rain falling through the wee hours of the morning, I was certain that doom and destruction awaited all my careful planning. By the time the sun came up, however, the sky had cleared. Some water had collected in the deep ends, but because we were starting in a shallow area, we had time to pump the rainwater out before we’d get to those areas. From that point forward, the job of mixing, plastering and moving on went pretty smoothly. Make no mistake, however: It was a stressful day, compounded by the fact that the hotel was fully operational and we were in charge of 65 workers who were supposed to be kept as separate from the hotel’s upper-crust clientele as possible. Just making sure that everyone showed up and was working according to plan required a major effort! All in all, I’d have to say things went very smoothly as we moved through the pool. A major concern had been achieving a consistent and proper mix for the aggregate material. I was reassured by the fact that Bruce Torrance was overseeing the mixing process: He’s the guy who created the Hydrazzo finish, and he worked long and hard to make certain we had material that was thick enough to build properly – but thin enough to level and trowel. The scale of all this is a bit mind-boggling: By the time we finished, it’s estimated that we used 15,000 gallons of water in mixing the 120,000 pounds of material. Filling the 600,000 vessel (above) takes time — and it was a tense time for us, because we didn’t want the new finish exposed to too much and the Florida sun as the process inched along. Given the problems Starlite had in removing the old material in some places, one of our biggest challenges was making certain that the finish on the expansive pool floor was level. We dumped material in place using wheelbarrows, then small battalions of laborers with broad squeegees hopped in to pull the material across the floor. Crews of finishers with trowels then followed, smoothing the surface. Two foremen were always on hand: They knew where the high spots were and conducted frequent checks of material depth to keep the Hydrazzo at least 3/8-inches thick. At the end of this long day, we’d spent a bit more than 12 hours inside the pool and had used just about all of the material. The choreographed movement of labor, material and equipment had come off virtually without a hitch, and I breathed a huge sigh of relief as I thanked the sky. 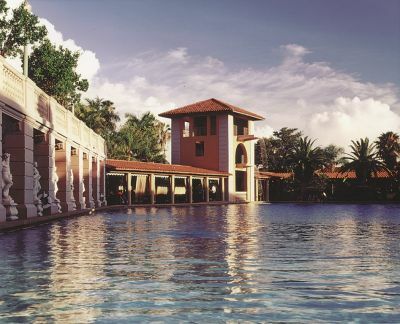 The swimming pool at the Biltmore Hotel in Coral Gables, Fla., is among the most historic in the United States. Built in 1926 as part of the resort’s original construction, the swimming pool’s immense size – 22,000 square feet holding a whopping 600,000 gallons of water – made it the largest inground concrete swimming pool in the country. 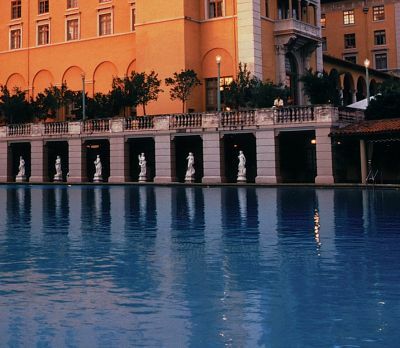 As beautiful as it is large, the pool is surrounded by cabanas, Moorish arcades and classical statuary. In the 1930s, swimming legends Esther Williams and Johnny Weissmuller starred in productions staged in and around the pool. The hotel overflows with history as well. 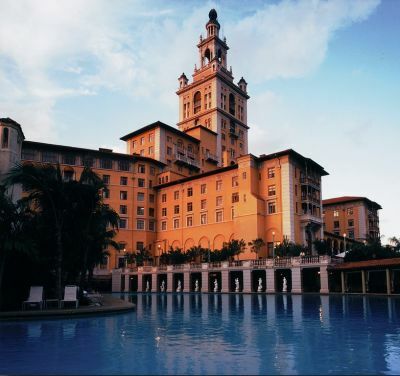 During the Jazz Age, the hotel typified the South Florida lifestyle and was host to the social elite of the day, including the Duke and Duchess of Windsor, Ginger Rogers, Judy Garland, Bing Crosby, Al Capone and many others. With the onset of World War II, the hotel was transformed into a hospital by the War Department – and remained a Veterans Administration hospital until 1968, when its doors were closed. In 1973, the City of Coral Gables took ownership of the site but did nothing with it for more than 10 years. In 1983, however, the city oversaw the old hotel’s complete renovation, a project that consumed four years and an estimated $55 million. The Biltmore reopened to the public December 31, 1987, and has assumed its rightful place as a world-class hotel and first-class resort. To this day, officials back the hotel pool’s claim to be the largest such vessel in the continental United States. The next day, we returned to begin the process of polishing the finish. The final look and texture of the Hydrazzo finish is achieved by exposing the large marble aggregate using a light acid wash and then polishing the coarse pieces of marble aggregate to the desired smoothness. One of the keys to success with this finish is to remove just the right amount of cement after the material has been applied. With a crew of six, we showed up with 300 gallons of muriatic acid – but ended up using slightly more than 100 gallons for the entire pool in a weak 3-to-1 water-to-acid mix that removed only the very top layer of cream. The acid washing went completely according to plan, and we were able to begin polishing at about 4 pm the same day. To polish the Hydrazzo, we used hydraulic tools called “Hydrotorques,” also manufactured by Aquavations. Helpfully, one of these was a prototype of a floor polisher — a real back-saver given the size of the pool’s floor. Their diamond abrasives cut through and polished the marble aggregate down to the desired final finish. On this job, we needed to keep an eye on both the smoothness and non-slip characteristics of the finish, as mandated by the local department of health. Our use of 70-grit abrasive wheels enabled us to polish the surface fairly quickly while leaving behind the necessary texture – a factor checked several times by a health inspector who was on hand throughout the polishing phase. With the surface finished, we began filling right away using a special manifold built by Starlite for attachment to a two-inch water main. Starlite handled the start-up along with my staff and Aquavations’ Randy Dukes; all fill water was run through a bank of carbon-activated filter tanks, given the tendency of South Florida water to contain a variety of undesirable mineral constituents. 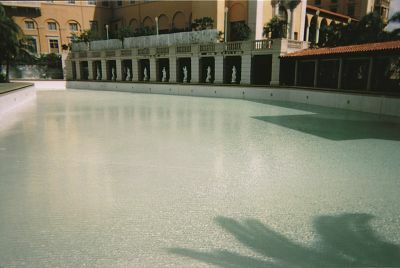 Best of all, the filtering and ongoing treatment meant the pool was ready for swimmers as soon as it reached capacity. We look back on this project with tremendous satisfaction and the sense that we all contributed to the preservation of a great landmark for generations to come. We spent a lot of time worrying that the finish would develop shrinkage cracks as a result of rapid curing; fortunately, the December weather stayed cool most of the time, and to date we’ve found no signs of any cracking. I’ve heard it said often that luck is the residue of good planning. Given the fact that nothing truly went wrong on this project, I’d have to say that we were indeed lucky. I consider myself fortunate in another respect as well: It’s always a pleasure to work on a project that, when you leave it, you have the sense that you’ve done something well, something that made you stretch your own abilities. Through the years, countless people have enjoyed this pool. I’m proud to know that for many, many years to come, our work will be a part of the experience people have when they take a dip in a swimming pool that has become a part of South Florida’s cultural heritage. At last, I’m certain that taking on this job was no mistake! Steve Lucas, president of Innovative Pool Plastering in Coral Springs, Fla., has been in the pool-construction business for more than 20 years. He is no stranger to large-scale projects: While president and owner of Aquatic Concepts, a commercial and residential construction firm, he supervised all elements of construction for the $1.5 million pool for the Marriott Hotel & Casino in San Juan, Puerto Rico. He also has worked extensively as a construction and hydraulic-design consultant and as a pool-chemistry instructor and field consultant. He also served on the supplier side of the market, working as national sales and technical-services manager for C.L. Industries, a supplier of interior surface materials, before founding Innovative Pool Plastering. Lucas has been active in both the National Spa & Pool Institute and the Construction Specifications Institute.